Our concerns about current and future climate change are focused on global warming. “Greenhouse effect” and “global warming” are two terms that are often considered interchangeable, whereas they are not, since they refer to two different phenomena. The greenhouse effect is a natural phenomenon that keeps the global surface temperatures higher than they would be if it were absent. As used in the current context, global warming refers to an increase in land temperatures caused by human activities (industry, agriculture, way of life, etc.). Global warming is a complex subject because it involves several parts of the Earth system. It is also a controversial subject because it is not easy to discriminate between natural influences and anthropogenic influences. And because they stem from our industrialized world and our way of life, the causes of global warming are and will be very difficult to eliminate, if ever we wish to do so. Opinions are divided on global warming among researchers and the various organizations are involved. Some, few, do not believe it outright, considering that it is a kind of collective hysteria and that the figures are crushed to believe the impending disaster. But the vast majority are convinced that there has been some warming during the last century. Some are still reluctant to link this warming to anthropogenic activities, while others, many more numerous, are convinced that Homo sapiens (Latin sapiens = sage!) Is currently altering the Earth’s climate and will continue to do so in the future. future. The species succeed each other on the planet for nearly 4 billion years. Homo sapiens is the first to understand it enough to knowingly modify it and control its future. 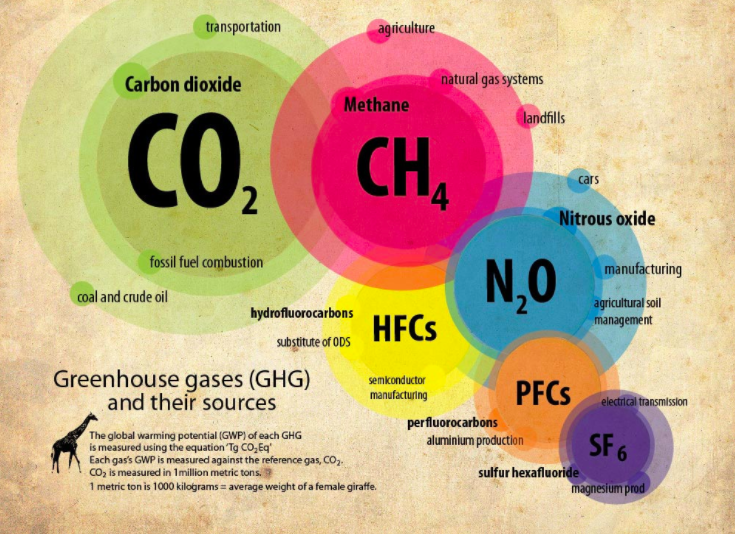 In the Earth’s atmosphere, the main greenhouse gases are water vapour (H2O), carbon dioxide (CO2), methane (CH4), nitrous oxide (N2O) and chlorofluorocarbons (CFCs). CFCs have an exclusively anthropogenic origin, whereas CO2, CH4 and N2O have a dual origin, natural and anthropogenic. By far the most abundant in the atmosphere, the water vapour is not directly related to the activities of man. Greenhouse gases do not all have the same ability to absorb infrared radiation; in short, their effectiveness in terms of the greenhouse effect is variable. Thus, methane is 21 times more efficient than carbon dioxide and CFC-12 (freon-12), 15,800 times more effective. It is the water vapour that is the biggest contributor to the greenhouse effect. In second place is CO2. Indeed, taking into account current gas levels and their efficiency in acting as a greenhouse gas, we can say, by simplifying the calculations, that in the current Earth’s atmosphere, it is CO2, after the water, which is the major contributor to the greenhouse effect; methane represents the equivalent of one-tenth of the CO2 contribution , the N2O one hundredth and CFCs one to two hundredths. It is therefore not surprising that CO2 emissions are targeted in the analysis of the causes of global warming. On the other hand, although CFCs are not major contributors to the greenhouse effect, the fact remains that they are extremely harmful to the ozone layer. There is no doubt that global warming or cooling is directly related to the quantity of greenhouse gases in the atmosphere, in particular CO2 and, to a much lesser extent, CH4 , two gases. related to the carbon cycle. The major problem that challenges researchers in the field is to distinguish between natural and anthropogenic emissions.